One hundred CHAUVET® MVP™ 18 video panels take on the stage as central part of an elaborate show, which features high-energy music, art, dance, and its main attraction: paint. 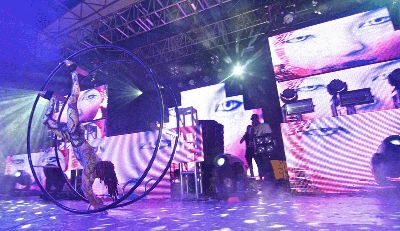 The MVP™ 18 video panels travel with the Dayglow Tour for a two-month marathon from March to May, for more than 50 shows in cities throughout the U.S. and Mexico. The tour entertains thousands of fans with spectacular DJ performances, soaring aerial acts, stilt-walkers, contortion acts, fire shows, and cannons to deliver the famous “Paint Blast.” Legendary DJs such as Laidback Luke, Robbie Rivera, Diplo, Funkagenda, A-Track, Porter Robinson, Alex Gaudino, Funkerman, Static Revenger, and resident DAYGLOW DJ David Solano performed live in front audiences reaching more than 5,000 people. “I looked for a way to fill a lot of negative space in the show,” Stenzel said of his structured design. Because the video panels are so lightweight—less than 20 pounds each—Stenzel was able to break up the design when needed in order to fit the show even in the rooms with the most intense rigging restrictions. Stenzel’s majestic stage design comprises eight different sections of video walls built in vertical layers and in depth. A central video wall of 36 panels flown mid-stage is flanked by two video walls made of 10 panels each, suspended from truss in mid-air. Two other video walls of nine panels each hung from a higher truss symmetrically on each side of the central wall. Towards the front of the stage, overlapping with the central wall, Stenzel designed a frontal smaller video wall of eight panels, and placed on its sides two displays of nine panels each. Each band of tri-colored SMD LEDs is covered by a diffuser lens, which not only protects the LEDs, but also makes it easier for Stenzel and staff to clean up paint splashes on the panels. “If we get a little paint it’s not a big deal, comes off right away with water,” he said. For temporary outdoor usages Stenzel removes the diffuser lenses to increase brightness. During the shows, MVP™ 18 video walls display original video content created exclusively for the Dayglow Tour using ArKaos MediaMaster Pro and ArKaos GrandVJ. During its 2012 tour, “the world’s largest paint party” has entertained in Cancun, Mexico, and U.S. cities including Panama City, Florida, Austin, Texas, and Athens, Georgia. Future performances are scheduled in Cincinnati, Ohio, Birmingham, Alabama, Washington, D.C., and more.